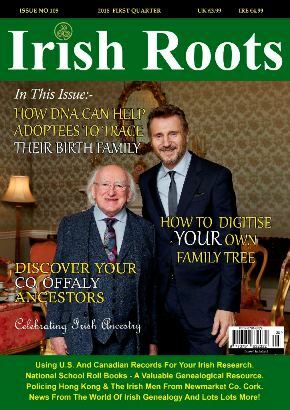 The Spring edition of Irish Roots Magazine, Ireland's only independent genealogy magazine, has been published. Inside there's a great spread of features, all written by well-established genealogists and experts. You can find out how DNA can help adoptees trace their birth family and how to start digitising your family tree. There's guidance on the resources available for researching ancestors in Co Offaly, how to use US and Canadian resources in your Irish research, and a dedicated look at National School Roll Books and their value to genealogy. On other pages you can learn about Irish connections in Australia, specifically through location and place names, and about Margaret Skinnider, a sniper during the Easter Rising who is buried in Glasnevin. There is also a surprising article about more than 20 men from Newmarket, Co Cork, who served as policemen in Hong Kong. As always, there's a strong news and comment element in the magazine, with my own What's New? Review rounding up the latest record releases and other developments; reports from Irish genealogy societies at home and abroad; observations on intriguing genealogical discoveries; and in this issue, details of two new projects – one to recreate records lost in the 1922 Four Courts Fire, the other to gather details of men injured or killed in accidents while working on the railways 1911-1915. There's always something to learn from the Q&A page, where professional research advice is provided to specific queries from readers, and a good selection of recently published history and genealogy books may help you find new direction and techniques for your research. Irish Roots is an essential friend for Irish genealogists and for those interested in Irish heritage. It's published quarterly and is available in both digital and print format, on subscription or in one-off purchases. See the Irish Roots magazine website for more information and a free sample of this new edition.